THE STRIPS THAT GOT ME IN THE MOST TROUBLE... SO FAR! In the fall of 1982, an event took place on the other side of the planet that would result in the greatest amount of ruckus made by the Klyde Morris cartoon. In the Middle East region of the world a group of radical Christians took it upon themselves to slaughter Palestinians in a refugee camp. Later, the AVION editor, a French national by the name of Julian Oleon took it upon himself to write an editorial piece in the student newspaper that was sympathetic to the Christians. I never read the editorial because, like everything that Editor Oleon wrote, it was fairly long-winded and highly boring. The Palestinian students on the Embry-Riddle campus, however, DID read the piece and were sent into a well deserved outrage. Suddenly, Mr. Oleon was receiving death threats and lots of other heat. Who can blame these foreign students from Palestine, their people have been the targets of such outrages for endless years, and so they were rightfully set off. Where they come from, when someone publishes something that outrages you, the way that they are often dealt with is by of some sort of retaliation. However, the Palistinenan students, in their rightful rage, neglected the fact that they were now residing in the United States where our ways of dealing with such things is a bit different. Seeing all of this banter, commotion and outright threats was just too much for a good editorial cartoonist to resist. Thus in the October 6th edition of the Avion, I ran two of the three strips showing Oleon being pursued by campus killers because of his editorial. Expectedly, this raised the level of rage. Unexpectedly, it turned almost every Palistinenan student toward me! One advantage that the cartoonist has is that almost no one knows your face, and in classes, the role was always called using my proper first name, “Walter” rather than my preferred middle name “Wes”, and the teachers always murdered the last name so badly that I almost always sat in class in complete anonymity. Thus I was a difficult target to zero in upon. 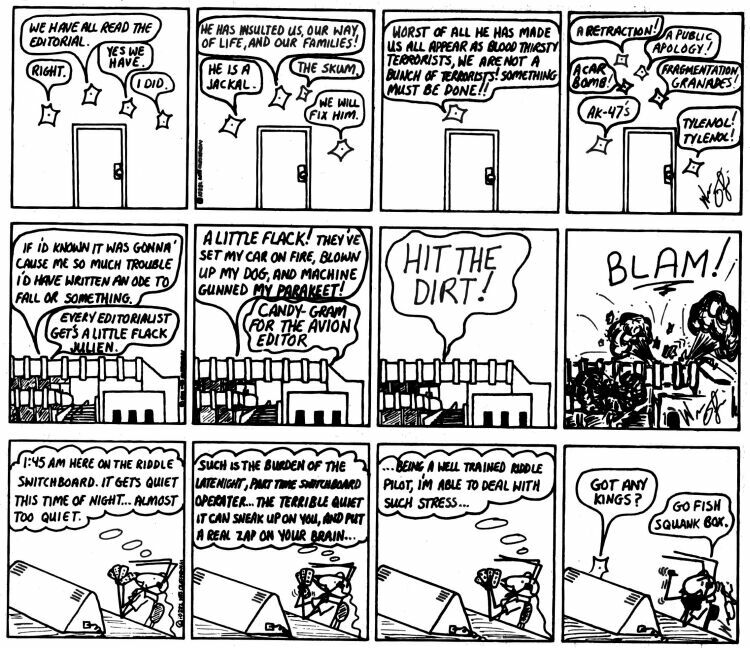 Still, for the days following the strip’s publication, I was under threat. Outraged Palestinian students would storm into the Avion office demanding to speak to that cartoonist guy, and getting the standard line from the staff, “We hardly ever see the guy, he just stops in and drops off the next week’s strip...” Of course I would be sitting right there quietly watching the now really outraged foreign student spit additional venom. They were now not only going to kill Oleon, but were going to find my house and drag me into the street, they were going to catch me on campus and beat me, they were even going to blow up my car! “He makes us look like terrorists! We are not terrorists! Just wait ‘till he tries to go to his car tonight!” Was the exclaimation of one such outraged Palestinian student. Bombing my car would have been a neat task, seeing that I did not have a car and actually rode a bicycle to school every day... I suppose that had they known that, they would have bike-bombed me. Under such pressure, I did exactly what I am best known for... 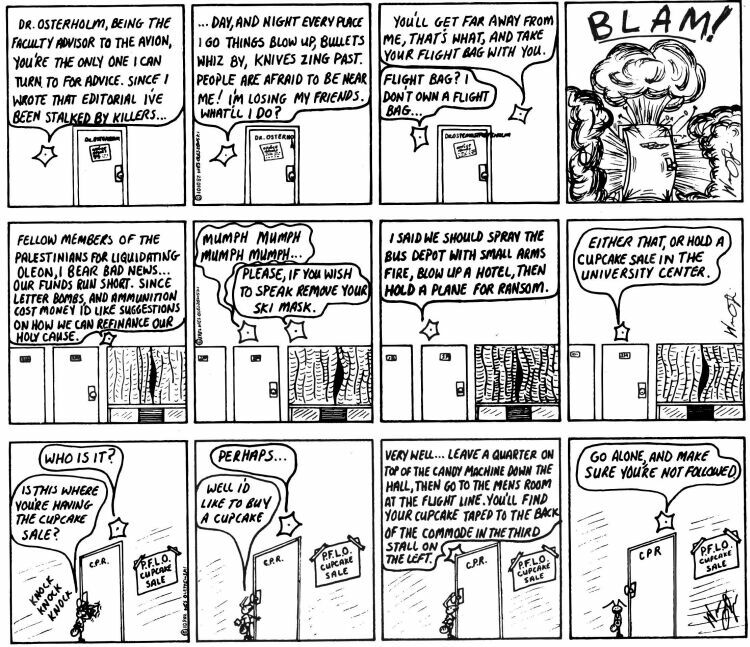 I wrote another series of three strips and this time all three were dedicated to making their heads explode. Taking off on the famed terror group, the P.L.O., I concocted the P.F.L.O. or “Palestinians For Liquidating Oleon”. Then I had them raising money for their holy cause by having a bake sale. That series appeared on October 13th, 1982, and reaction was HIGHLY predictable. This time the group of Palestinian students went to the Student Government Association or “S.G.A”., who held the budget for the newspaper, and demanded that all Avion publication be stopped. Like any organization which has the word “Government” in its title, the S.G.A. was spring-loaded to tread upon the liberty of the masses in answer to the vocalizations of any minority group, and indeed threatened to pull the Avion’s funding unless I was stopped. The Avion staff responded by telling the S.G.A. that we had enough ad revenue to publish without S.G.A. funding and then pointed out that the S.G.A. itself would actually lose revenue without the paper. But, like good politicians, the S.G.A. idiots were not so easily put off and demanded a meeting with the Avion staff to discuss and settle the issue. “Will the real Palestinian please stand up?” I said. It was much like throwing a bucket of aviation gas into a campfire. In the week that followed that series of cartoons and that meeting, I had the P.F.L.O. in the library thumbing through “Janes All The World’s Terrorism”, but that one was too much for even Editor Oleon, and he pulled it to show the Palestinians that he would actually edit the outrageous stuff and that is how the system works in this country. The S.G.A. faded away, because they did not have a financial lever to use, and the Palestinian students, with the exception of Ali, never did quite manage to figure out who that cartoonist guy was. To this day, however, I always check my bicycle for bombs.